It was well past midnight when Belle LeClair ventured downstairs to investigate the sobs coming from her dead husband’s study. The dim light of the lamp she carried didn’t dispel all the shadows in the hallway—or the feeling she was observed from some dark corner. In this house she always felt watched, followed, never left alone. She paused outside the room that had been locked to her all the time she’d lived here. Another heart-wrenching wail—her mother-in-law was in there again. Belle pressed her palm to the door and pictured the woman inside. She would be crying over treasured artifacts of her murdered son’s life. Things she’d never share. Mrs. LeClair was merciless in her need to control her world. But then, she’d just lost her firstborn child. It was impossible not to feel some pity. If only she’d allow Belle to comfort her. If only they could comfort each other! But the one consolation the old lady demanded was something Belle couldn’t give. She couldn’t marry Wade’s brother, a repugnant thought in several ways. Even setting obvious objections aside, the man himself was unappealing. Wesley LeClair was a pale imitation of his older brother, terrified of his mother and indifferent to his occupation. He held no opinions of his own—at least, none he’d ever spoken of in Belle’s presence. And there was one thing about him she absolutely couldn’t abide. Like Wade, Wesley was a Special Deputy US Marshal. In the greater scheme of things, Belle and Wade hadn’t been long married—only eight months—and her grief might not run so deep as her mother-in-law’s, but it was no less real. They’d been at the beginning of love, deliciously contemplating all possible futures, eager to establish their own household and begin building a life together just as soon as he returned from his special assignment. But Wade had returned in a casket, murdered. 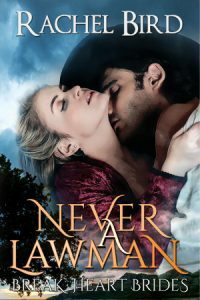 Their future together evaporated in the time it took a coward to fire a six-gun, their dreams replaced by a hole in Belle’s heart, unbearable sadness, and an aching sense of having lost something crucial that she couldn’t define. She blamed Wade’s profession bitterly. If only he hadn’t been a lawman! And now she was alone and trapped in this house. What to do next? She was terrible at making decisions. She tended to suffer in silence until she snapped. Then she’d act spontaneously on a whim and find herself stuck with unforeseen consequences. Though Belle was frozen in uncertainty—What to do?—Wade’s mother was not. Yesterday at breakfast, Mrs. LeClair had dropped the first hint of her new scheme. I don’t want you to worry about your position, my dear Christabel. We’ll see you’re taken care of. In fact… Wesley, as you know, is unmarried. Belle pretended not to understand. Indeed, at first she thought she must have misheard, for she expected quite the opposite—to be thrown out of the house as soon as public opinion would allow. One, Mrs. LeClair had never liked her. And two, she had an heiress in mind for Wesley—Miss Evangeline St. James of New York, whom Belle had befriended at a Christmas party last December. The one thing she’d done right in her mother-in-law’s eyes. So you can be useful as well as ornamental, after all! But now, apparently, Mrs. LeClair’s aims had taken a different, shocking turn. She’d decided Belle was a living memento of her favorite son and therefore must remain one of the family. She would be relentless in this, as in all things. Once an idea was fixed in that woman’s head, no matter how morbid, it stayed fixed. Mrs. LeClair always knew she was right. Was it all for effect? Did she know Belle stood on the other side of the door? She was so strong! Righteous and unyielding as marble. In her presence, Belle second-guessed all her own desires and opinions, down to her very sense of herself. She was losing the memory of who Belle Steele was before she became Belle LeClair and Wade brought her here to live with his mother while he took on that terrible special assignment. With each passing day, a bit of herself fell away, to be reconstructed and replaced by Mrs. LeClair. Soon she’d be an entirely different person, one of her mother-in-law’s design. The one rock she’d clung to in withstanding the juggernaut that was Sophronia Mandeville LeClair was the promise of Wade’s return. Then last week, they’d learned of his murder. Three days ago, his preserved body had arrived, shipped by train. Two days ago, they buried him. Belle had sleepwalked through it all, numb to the world. Today during luncheon, Mrs. LeClair had again broached her object, musing blithely on the details as if Belle had already agreed to the concept. You’ll have to wait a decent interval of mourning, of course, but as Wesley is my son, there can be nothing improper in his visiting this house. She’d gone to call on him, interpreting Belle’s wish to remain behind as a good tactical move. Whether by chance or in answer to Belle’s prayers, while Mrs. LeClair was out, the afternoon post had brought a letter from Belle’s mother—and a glimmer of hope. If Belle had any sense, she’d ignore it and go back to her room. The letter, Belle. Think of the letter. But her heart went out to the distraught mother behind that door. She should at least offer a kind word. She put her hand on the knob—which refused to turn. She scoffed at her naïveté. Mrs. LeClair would always lock her out, even while trying to lock her into this life and under her rule. With a burst of anger, something clicked in Belle’s brain. She rushed back upstairs, her mind clear. Suddenly, the way forward was obvious—if she had the courage to take it. As she reached her bedroom, a nearby movement startled her. Her maid stood not three feet away, half-hidden in shadows by the deepest black she wore from head to toe. Mrs. LeClair hadn’t paid for the maid’s clothes, of course. Finola’s mourning was her own, from a past loss. “Is everything all right, madam?” Finola Burke had to be the coldest lady’s maid in the history of cold lady’s maids. Finola was supposedly Belle’s maid, but in practice she was Mrs. LeClair’s spy, tasked to ensure Belle never went anywhere, did anything, or voiced any opinion without it being reported back. Finola actually sniffed. Her disdain for Belle was greater even than Mrs. LeClair’s, especially once they’d despaired of Belle’s being pregnant. She’s a pretty enough ornament, but useless. Belle had overheard a conversation between the two. She couldn’t even give me a grandchild! Producing Wade’s child might have redeemed her. Would have compensated for being a nobody. Poor. Without connections. A sexton’s daughter. From Minnesota. It was an obligatory question. Finola didn’t really want an answer. This time Belle didn’t care. “Yes, you can.” Her heart pounded. If she was to escape, she had to set it in motion now. “Of course, madam.” Finola sniffed again. That was as far as she’d allow herself to lose composure. Belle turned up her lamp and got into bed. She set aside the book she’d been reading and opted instead to again read her mother’s letter. It is with some trepidation I write to inform you that Mr. Steele has chosen to remove us from the bosom of all our friends and relations and set upon a new path. He is done with fighting locusts and a sexton’s low pay and will lay claim to a homestead in the new state of Colorado. To finance the endeavor, he has sold the bulk of our earthly possessions, including this house where all our children were born. We leave Minnesota forever on Saturday next. I will write you again when I know our new address. The bedroom door opened and Belle shoved the letter into the back of the book. She pretended to be engrossed in The Odyssey and didn’t look up until Finola set the tray on the bed. And that was the boldest thing Belle had ever said to Finola Burke. As soon as the maid was gone, she wrapped all but one of the cookies in a handkerchief and tucked them into her handbag for later. I’m going to do it. I’m going to do it. Then she took half a cup of tea to her desk and penned a note to Mrs. LeClair. I would have told you last night of my plans but did not wish to disturb you in your grief. I have been invited to visit my friend, Miss Evangeline St. James, in New York for a time, and I’ve decided to accept her kindness. I shall consult her as to your suggestion regarding Wesley. Oh dear. The signature was too formal. Well, it was too late. There was nothing to do about it now. Belle couldn’t concentrate well enough to write it over. Everything in the letter was a lie, sort of. Evangeline had invited Belle to come to her, but Belle hadn’t accepted. And Belle had no intention of marrying Wesley. Perhaps it was cowardly to do it this way, run off like a thief in the night. But it was the cowardly way or no way at all, for she simply had not the power to stand up to her mother-in-law. She added three generous drops of laudanum to the teapot. The doctor had given vials of the stuff to her and Mrs. LeClair as a balm against their grief. Belle didn’t believe Wade’s mother had taken any—the woman wouldn’t give up her precious agony—but once in despair Belle had tried a dose. She’d liked it—too well. For a brief time the world had become a very pleasant, if false, place indeed. She never took any more, afraid she wouldn’t wish to stop. The real world was unpleasant and heart-breaking, but better to face that reality and make peace with it than be forever lost in phantasmagorical, but false, illusions. She set the tray outside her door, not surprised to hear the deft swoosh of Finola’s skirts from somewhere down the hall. Belle didn’t close her eyes all night, afraid she’d fall asleep and lose her chance. She packed a traveling satchel with a nightgown, change of stockings and underthings, her toothbrush and the little bottle of toothpaste made from Dottie’s secret recipe—dear Lord! What was she doing, abandoning civilization? She added Wade’s photograph—and of course his letters. Several times she patted her skirt pocket to be sure the watch he’d given her was still there. To count the hours until our reunion. The mantel clock chimed a quarter past four. It was now or never. She peeked outside her room. All clear, the tray gone. She crept downstairs feeling her heart would pound its way out of her body through her ears and throat, down to the basement kitchen, the one place in this house where Belle had been happy. The alcove caught her eye. It was where Cook kept her journals of accounts—and cash for the household’s petty expenses. Belle reached under her bonnet and took a pin from her curls. She found the cashbox, and her hand trembled as she worked the lock, thinking of her brother in heaven. Mark, if you’re looking down, tell St. Peter you taught me this skill. The lock clicked open, and she removed twenty dollars. She’d return it as soon as she could, even if she had to sell her jeweled mourning brooch, but at this moment she needed cash money. A loud snore scared an involuntary squeak out of her. She spun around to see Finola, passed out, her cheek smashed against the servants’ table and a bit of drool at the corner of her open mouth. In half-surprised relief, Belle swallowed a laugh. Finola had taken the bait. The teapot and an empty cup sat near her head. Belle had always suspected the maid of finishing what was left on her trays—and even understood it. Mrs. LeClair didn’t feed her staff overly well. Tucking the coins into her handbag, Belle crept out of the alcove and past Finola. All that remained was to get outside through the servants’ entrance and take the back stairs up to the street. She’d find a cab to the station, or walk if she had to, then board the first train heading for Minnesota. She pushed open the door, and a cold whoosh of predawn air stole into the warm house. This had been easier than she expected. Belle whirled around. Dottie must have come in to see to the morning fires. She was Cook’s niece but twice the cook her aunt would ever be. They stared at each other for a good minute. Dottie, like the other servants, wore a black armband. All the staff had adored young Mr. LeClair and would show their respect. Belle blinked away a tear. “Madam?” In dismay, Dottie looked from Belle’s satchel back to her face. She had taught Belle so much. More than mere cooking and baking, also how to run a kitchen, gauge and order supplies, plan for special events. One day soon you’ll be mistress of your own house. You’ll be prepared when that day comes. And now Belle was abandoning her. She checked again to make sure she had Wade’s watch. Then she left the house on Bowdoin Street forever.